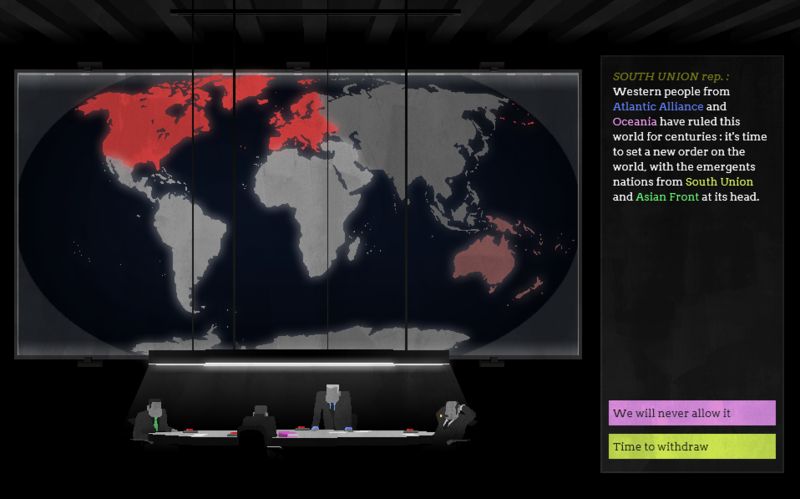 A moody textual stategy game about political tensions. A game by @_JediMind, @Telicoria and @BlueTheLemon. Made in 72h in Construct 2 for Ludum Dare 37. The theme was "One Room". I think it is a good short game but the premise is not correct. It should be: "Will Oceania be able to avoid a global nuclear war until it can come out on top ?" 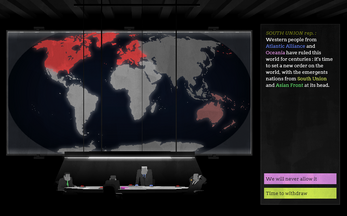 and not "Will Oceania be able to avoid a global nuclear war and come out on top ?" Reason for this is that the war is unavoidable, so the only way to "win" as Oceania is to is to get your country on white levels. There is only one end ? By the end, I got all the way to the end with light gray everywhere, but suddenly RED! DEATH! I didn't have a bad time, I just didn't seem to have caused aggression, but suddenly I failed? I guess it isn't failing, just a comment on the inevitable? I did have fun, either way. The references to history (and the present politics) was very fun, if a little depressing. Yes, part of the game was about the inevitabilty of the conflict. It's just weird that it happened so suddenly to you. Thanks a lot for playing ! Thank you :3 I'll make sure to say it to the team !